From Monday 29th October, we will be operating a “book on the day” system. This will allow patients to telephone the surgery on the day that they wish to book an appointment. Our telephone lines open at 08:00 and close at 18:30 each evening. Please contact the surgery as early as possible for a same day appointment. The Receptionists have been asked by the Partners to take some brief details from you about the nature of your problem, in confidence, to help direct you to the most appropriate person. Practice Nurse and Healthcare Assistant appointments can also be pre-booked for your convenience - please ask a member of reception for more details when telephoning. When you arrive at the West Quay surgery, you will find a self-check in system in the main reception area on the ground floor. This system is to check-in to see a doctor or nurse without the need to inform the receptionists. This is used to reduce queueing at the main reception desk. On arrival at Rhoose, please let the receptionist know you have arrived for your appointment. We ask all patients to arrive a minimum of 5 minutes before the appointment time; this helps ensure the smooth running of everyone's appointments. Given the demands on doctors' and nurses' time, we cannot guarantee you will be seen if you arrive beyond the appointed time. If you are more than 10 minutes late for an appointment, you will be asked to re-book your appointment. If you cannot attend an appointment for any reason please inform us as soon as possible in order for us to give the appointment to somebody else. Whilst we encourage our patients to come to the surgery, where we have the proper equipment and facilities available, we do appreciate this is not always possible. In this respect, if you do need a home visit, you can help us by calling reception before 10:00 and by providing us with suitable details. You may only request a home visit if you are housebound or are too ill to visit the practice. Your GP may contact you via telephone in order to prioritise home visits. You can also be visited at home by a community nurse if you are referred by your GP. You should also be visited at home by a health visitor if you have recently had a baby. For patients who live in Rhoose and the surrounding areas, we operate a part-time branch surgery in the heart of Rhoose village. We share this branch surgery with Eryl Practice. We have a single telephone number for the whole Practice which is 01446 722792. All of the paperwork for Rhoose patients (other than dealing with repeat prescriptions) is administered from the surgery in Barry. Your pharmacist can provide free confidential advice and treatment without you having to make an appointment to see your GP. There are several pharmacies that are taking part in the "Choose Pharmacy" scheme (listed below). 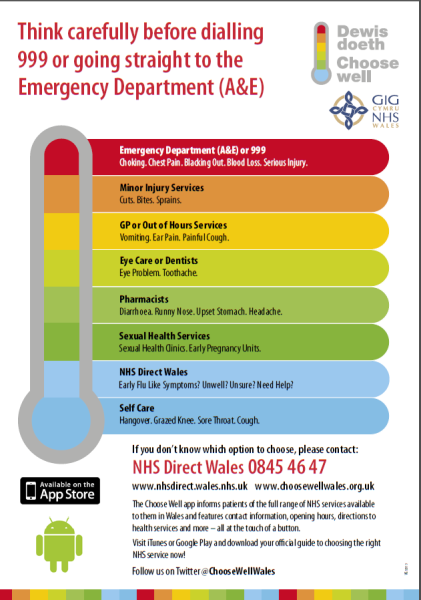 Please contact each pharmacy before attending to ensure that there is a pharmacist available. If you become unwell or are injured, make sure you choose the right NHS service to ensure access to the best treatment. The below leaflet provides information for parents about the management of respiratory tract infections (coughs, colds, sore throats, and ear aches) in children. Your guide to coughs, colds, earaches, and sore throats for children.